WWE Intercontinental Champion Seth Rollins recently did an interview on 105.3 in San Diego to promote this week’s episode of Monday Night RAW in San Diego, CA at the Valley View Casino Center. During the interview, he gave his take on WWE Universal Champion Brock Lesnar’s schedule as he’s a part-timer in WWE. This is where Rollins stated that he understands the situation and how he hasn’t been on RAW in some time but from his standpoint, he knows that he’s someone who is on the show every week and doesn’t miss a live event. Rollins is trying to bring fans to see these shows and that’s where it’s insulting to him. “It’s slightly insulting to me, he’s the champion, he’s the face of our show, and he’s not at our live events.” Rollins continued by stating that it makes things hard when trying to sell tickets to live events and that he thinks the champion makes the championship. Rollins tries to be the champion that the show needs due to the fact that their top champion isn’t around. 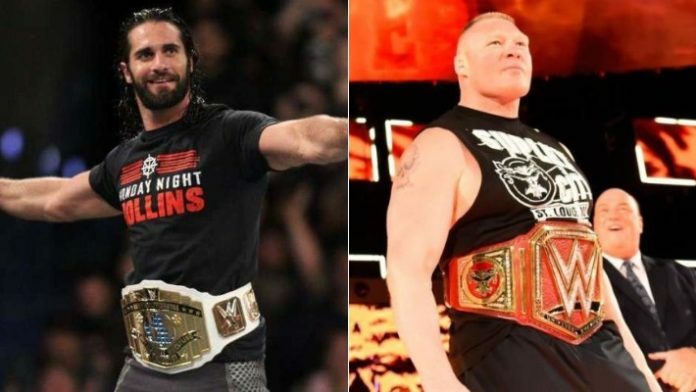 “To me, the Intercontinental Championship is the Championship of RAW, and has been for the last year.” In Rollins’ mind, it’s due to how long Lesnar has been Universal Champion off and on.